Allert Warners (1914-1981) worked since 1936 at the practice run by his father Philip (1888-1952), taking over after the latter’s death. 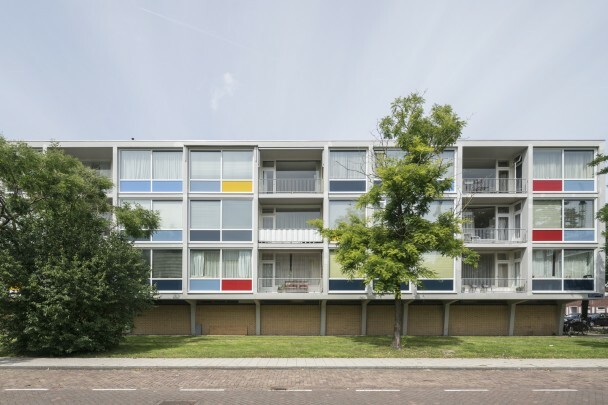 In the 1950s, he designed two striking housing projects in Amsterdam — striking because of their Corbusian parti but most of all because of the colour schemes of the Belgian artist Joseph Ongenae. Ongenae himself spoke of ‘functional glass-facade colourism’. The four blocks of houses in Amsterdam-Zuid have four storeys atop a set-back basement containing entrances and storage space. During renovation work on the frontage, the frames were replaced with plastic ones and the panels replaced with new ones coated in coloured foil in a modified colour scheme. The block at Dirk Schäferstraat 1-27 is still in its original state.